Yeld J. 2014. Pet shop bishop baffles birding buff. 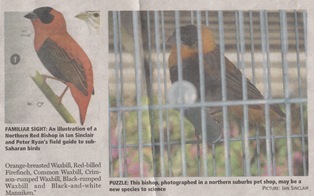 Cape Argus 11 June, p12. Summary. This mysterious bishop, photographed in a northern suburbs pet shop, may be a new species to science. These were Orange-cheeked Waxbill, Orange-breasted Waxbill, Red-billed Firefinch, Common Waxbill, Crimson-rumped Waxbill, Black-rumped Waxbill and Black-and-white Manniken. One bird in particular caught his attention: a "yellowish-orange" bishop known in the pet trade as the Black-crowned Bishop, but which doesn't appear in the scientific literature. This is simply a Northern Red Bishop. In captivity birds may be paler when their diet in captivity does not contain sufficient carotenoids than in the wild, due to differences in diet. This is well known to aviculturalists, who specifically mention the Northern Red Bishop, which is also known by many other names including Orange Bishop (eg Vevers HG, 1958, The loss of red colour by birds in captivity. Avicultural Magazine 64:186). Bishops of mixed species in captivity may also produce hybrids, but this would not constitute new species to science.